@Ameera - why drop yea ? @ThegreedZ - Ringgit drop will effects? If y,ou can hold this stock, just keep it. Don't sell. unless it's contra or margin call. 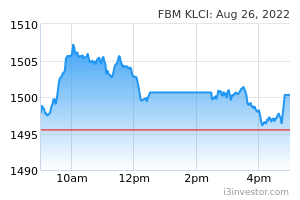 Global Index Provider FTSE Russell -WGBI said that it would review Malaysia's market due to its concerns about market liquidilty. Everything is not confirmed yet and the market got pacnicked. .The country is trying to save more money by cutting off mega projects, clean up corruption, impose some taxes, can anyone say that all these actions taken is to prove that Malaysia cannot pay debts? Rediculous! keep for another 6 months and you will witness again how the stocks will climb up. Life is as normal, banks are still running so do businesses. Remember Dsonic once plunged to 0.30 last year and now it has shed off the negative news. However, this time it's more wide spreading- most of the KLSE stocks e.g. Maybank, Public Bank, Tenaga etc. Short-selling activities also negatively impacted the market. Buy and hold for a while. Sell for what? There is no bad news from the company. If you buy this round, you will make just like i ignored the market noises and bought at very low price and now i am making good money, the logic is buy low. If you sell a sstock at a low price without understanding that the fundamental of the company is the same and chasing buy on breakout stock , What is the logic ? The cashflow from operating activities is still healthy, Please go to Bloomberg and check. Last year i bought at 0.35 and i sold them at 0.55. This round i bought at 0.48 and i can sell them at 0.55 too. or you prefer to buy from me at 0.55? and when you cut loss i buy back from you. i bought some at 0.49.
with the healthy cashflow from the operating activities, the likelihood or the probability of renewal passport contract is higher. Thegreedz, i am not here to convince you, so if you are not sure, please take up a course to study the basics berore you call yourself a trader or invesstor. Also, don't forget to study the background of the stock that you bought since you are not sure. @berry - perhap you could conduct one, then we’ll be your apprentice.